The Soviet-era practice of holding show trials for individuals accused of relatively minor economic crimes is alive and well in Turkmenistan, and local observers say that once in the system, defendants have no chance of a fair hearing. For the state, it is a demonstration of power, and for the security agencies, an opportunity to show they are fighting crime. The latest took place in the northern town of Dashoguz, and involved nine workers at a printing house, including the deputy director, who were convicted and imprisoned for stealing paper and using it to do private print jobs. 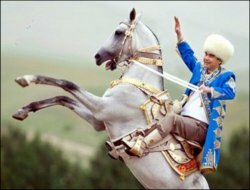 Staging cases of this kind, imposing draconian sentences, and using the state-controlled media to highlight them were a feature of life under the Soviet system, then under independent Turkmenistan’s first president Saparmyrat Niazov, and now continue under his successor Gurbanguly Berdymuhammedov. They give less sophisticated TV audiences someone to blame for the state of the country, and show that the government is doing something about it. The commentator in Dashoguz recalled that when government ministers, provincial governors, bank and university officials fell from grace under Niazov, the media reporting encouraged a kind of public schadenfreude. “People used to really enjoy those TV programmes that showed the houses owned by the corrupt, the luxury cars, the kilograms of gold and jewellery, the stacks of banknotes,” he said. A lawyer in Dashoguz who was involved in another recent group trial, of 25 oil and gas company workers, says the prosecution aims to get as many people into court as possible. The main actors often escape untouched while the rest are inevitably convicted, even if their role in the alleged offence was unintentional and incidental. Lawyers say that if the case is brought by the Ministry of National Security, MNB, rather than other agencies, the defendant has no chance of an acquittal. “In cases of that kind, even if the defence lawyer produces convincing evidence of his client’s innocent, the judge will use only the prosecution’s findings,” one lawyer said. Another lawyer, also speaking on condition of anonymity, described his experience of acting for one of 17 staff from a cotton-ginning plant in Dashoguz in a collective trial. The lawyer said that as a result, his client was convicted of a crime he did not commit. Despite the procedural flaws, the trial seemed to have the effect intended. “After the trial, I overheard people discussing my client. They didn’t know anything about him, but they were delighted that justice had triumphed,” he said. A retired lieutenant-colonel in the MNB said the law-enforcement agencies made it their business to exaggerate the gravity of cases they investigated, and to send large numbers of people to court. This article was produced as part of IWPR’s News Briefing CentralAsia output, funded by the National Endowment for Democracy.